Experience has taught me – and I’m sure many if not most of this blog’s readers – that the more board-savvy its CEO, the more effective a transit board is likely to be as a governing body and the more favorable the odds of building a rock-solid board-CEO partnership that can withstand the inevitable stresses and strains that come with leading a modern transit system. So transit boards have a big stake in recruiting CEOs whose governing intelligence is well developed. This is certainly a point I strongly made in the program I co-presented with Dave Stackrow, APTA Vice Chair, at the Transit Board Members Seminar in Chicago last July. And I’ll be making it strongly in various other forums in the future. Flipping the coin over, transit CEOs being interviewed for a the top spot in a new authority, along with CEO-aspirants being interviewed for their first job, have an equally large stake in being able to demonstrate their board-savvyness during the interview process. So I thought it might be useful to share what I’m telling transit boards about determining the board-savvyness of CEO candidates. First I tell them that their search committee should interview at least the officers of the candidates’ current or immediate past board, asking them to assess the board’s working relationship with the candidate in terms of strengths and weakness, to identify important relationship issues that might have developed, and to describe how particular issues were resolved (or not). What is your detailed definition of the governing role and major functions of the board? How would you assess your working relationship with your current (or immediate past) board in terms of: strengths and weaknesses; relationship issues; how issues were resolved? What concrete steps did you take to help your board become a more effective governing body? What concrete steps did you take to strengthen your working relationship with your board? What steps did you take to help your current (or immediate past) board play a more effective role in planning and performance monitoring? What board committees have you worked with and which ones were most effective in promoting effective board governing performance? What do you consider the key elements of an effective process for our board to evaluate your performance? There are many other questions that board members on the search committee might ask, but the point is to be both specific and open-ended in asking about candidates’ governing knowledge, philosophy, and experience. In my experience, it doesn’t take very long, if one listens carefully, to get a good sense of a candidate’s board-savvyness. 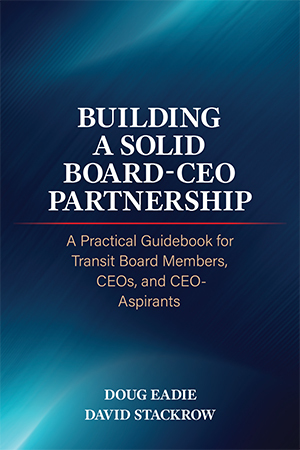 Of course, the questions would need some revision for use with CEO-aspirants without experience working directly with a transit board, but with some tweaking, it would still be possible to determine how much thought they’ve given to the work of governing and to the board-CEO partnership. Now, if you’re a candidate for the top spot in a transit authority, you’ll want to think about the above questions, not only to respond to questions, but also to demonstrate how board-savvy you are even if the search committee doesn’t ask all, many, or even any of the above questions. 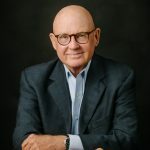 And even if you’re not looking for a new CEOship, just giving serious thought to these and other governance-related questions will make you more effective in building and sustaining your partnership with your board.